Jean Baudrillard was one of the foremost intellectual figures of the late twentieth century and his work is currently reaching a new prominence in the English-speaking world. Known as the “high priest of postmodernity”, Baudrillard never directly addressed theological concerns. However, his provocative analysis of the changing nature of reality, subjectivity and agency is of increasing importance to contemporary theology. James Walters’ Baudrillard and Theology is a new and lucid way into the ideas of a brilliantly challenging writer, finds Mike Gane. Baudrillard and Theology. James Walters. Continuum. July 2012. There is a voluminous literature on French sociologist and philosopher Jean Baudrillard, who died in 2007. 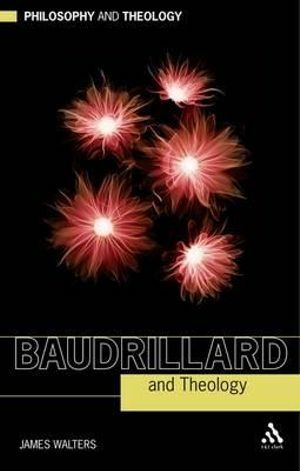 James Walters‘ addition to that literature considers Baudrillard’s writings in relation to Theology – could it regenerate it to some extent? – in the same way that others have sought to use Baudrillard in relation to social theory, politics, cultural studies, film studies, philosophy, etc. The product is an attractively written account of Baudrillard’s ideas (part one, pp 11-63), followed by chapters which examine the challenge to Theology that these present (part two, pp 65-144). Although others have considered Baudrillard’s allusions to theology in a general sense, inter alia, (and Nicholas Zurbrugg had planned a book on this before his early death) this is the first that looks at this aspect of his work in detail. There are certainly indications in Baudrillard’s writings of an interest in religion and theological issues, but he did not use a theological vocabulary. When asked if he had a protestant or catholic background, he simply said ‘no background’. But then, there is photo of him aged ten in a religious context which appears catholic, and there are many references to catholic issues (the pope, even the local catholic priest’s sermons in the church at Leucate his summer retreat) throughout his writings. So Baudrillard attended church regularly? One presumes he was a catholic, and did come from a practising catholic family. But there is a lack of evidence, and no one has ever pushed this question with him in his many interviews. So it is possible as this book claims (no evidence is provided) that he was protestant. This claim does not feature as a central issue or become a dominant theme, but it does colour the interpretation here and there. The main claim is that Baudrillard’s whole theoretical orientation rests on a challenge to the assumption that the only thing that exists is a real world. Baudrillard uses the language of nihilism to express this, holding that the Nothing is at the beginning, and runs throughout eternity. What exists emerges out of this Nothing, and can only be understood in relation to it, since everything that is called real is in fact only a form of illusion – hyperreality, virtual reality, etc, are versions of it. But there are different kinds of illusion, the vital illusion of the world in symbolic exchange is primordial, and has always acknowledged this to-ing and fro-ing with Nothing, with reversibility, with the metamorphoses of life and death. Walters suggests that what Baudrillard has done is simply use the word Nothing as a stand in for God. The rest of the argument follows from this, even his contention that Baudrillard’s concept of radical thought ‘is more akin to prayer than to rational theorizing’ (p. 135). Thus the development of positivistic, and neo-liberal theology would come under critique from this position, as would all developments of modern science and social science that ignores this ‘underlying fabric of all things’. In fact, Baudrillard even says that to engineer an entirely positive world by technical means is ‘from the theological viewpoint, a total heresy. It is a diabolical temptation to wish for the Reign of Good, since to do so is to prepare the way for absolute Evil’. He develops the theme of evil at great lengths in his later work, evidence that he had systematically broken with the language of the modern social sciences. His language did not become overtly religious or theological however. It might best be described as metaphysical, and pataphysical. He did open up the possibility of a parallel way of expressing and developing these ideas, and this is what Walters has done quite diplomatically and brilliantly; ‘in his rejection of Nietzsche’s emphasis on the human and his ‘will to power’, Baudrillard goes to a deeper nihilism that is the mystical foundation of belief and is a basis even for hope’ (p. 141). From this link to theology via the Nothing, Walters goes on to consider what drives Baudrillard’s work. ‘He seeks the symbolic relation between people that market exchange has eroded and his bleak description of what has replaced it is a provocation to rediscover it. This crisis of human sociality (cognitive, political, ecological) that Baudrillard recounts must be the primary concern of theology today’ (p. 5). The examination and discussion takes us through the central arguments on consumerism, hyperreality, internet culture, simulacra, evil, terrorism, death, the body, radical alterity, etc. These topics are coherently chosen from the vast number Baudrillard dealt with, and there is a convincing argument that these together do form a challenge to theology. Walters does not push his argument too far since Baudrillard did write very critically of Christianity, (basing his analyses on the more anthropological notion of gift exchange taken from Marcel Mauss) and of the ‘social’ (sociality does not arise between people as such). So there is an acknowledged humanisation of Baudrillard’s position here. In a central section Walters moves to discuss the more basic ideas of ‘singularity’ and ‘impossible exchange’, and, considering its significance for theology, the discussion tiptoes through a minefield. But perhaps it is to leave their impact until the end, when Walters gets to discuss one of the most difficult of Baudrillard’s ideas, that of radical otherness. Perhaps, he asks, this is a ‘weak mysticism’, a metaphysics of the object? No. In an interesting comparison of Baudrillard with Derrida he suggests that, ‘Baudrillard’s otherness is a sacramental world to which we abandon our autonomous selfhood’ and goes on to say ‘Baudrillard’s understanding of an otherness rooted in ritual (rather than economic) exchange is more intrinsically relational (and despite himself, more conventionally Christian)’ (p. 137). This then is a reading of Baudrillard which is exploratory, suggestive, that seems throughout to be musing over his writings (p. 7). It will be for many, a new and lucid way into the ideas of a brilliantly challenging writer. One to reflect on, especially for nihilists and atheists, centring on the ‘impossible exchange’ between the Nothing and nothing. Mike Gane is Professor Emeritus at Loughborough University. He has written widely on French social theory, particularly the work of Jean Baudrillard. Read more reviews by Mike.